Do you work in one of those office settings where your coffee goes cold the minute you sit down at your desk? Perhaps you work outdoors and love a coffee or tea at lunch but it’s really hard to keep it warm during those cold winter months? Or maybe you love getting out and camping and hiking during the weekends and holidays but hate drinking from plastic mugs. We have the solution to all of your problems – the branded 220ml Stainless Steel Mug. This promotional mug is perfect for any of your clients and customers who either don’t get a chance to drink their coffee while it’s still hot, or work and play in an environment where a ceramic mug just isn’t practicable. 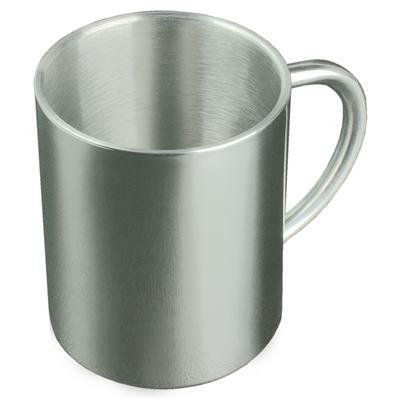 This Stainless Steel Mug will keep a coffee or tea warmer for longer, and due to the stainless steel finish, will look great with an engraved logo print, pad print or screen print. Depending on the printing method chosen, your logo print will range in size from 40mm x 40mm through to 185mm x 70mm giving you plenty of room to get your brand name out there. We know that promotional mugs, especially promotional thermal mugs, can be expensive to buy and while our Stainless Steel Mug is a good quality make, it won’t go breaking the marketing department’s budget. The Stainless Steel Mug is a great option for a range of promotional purposes including giveaways and corporate gifts and can be presented in a range of gift boxes or as part of an overall gift hamper. They are also a good option for event giveaways and can be easily included in event or function gift bags without needing to worry about them breaking on the way home. For a quality promotional coffee mug that your customers will love, you can’t go past the Stainless Steel Mug.